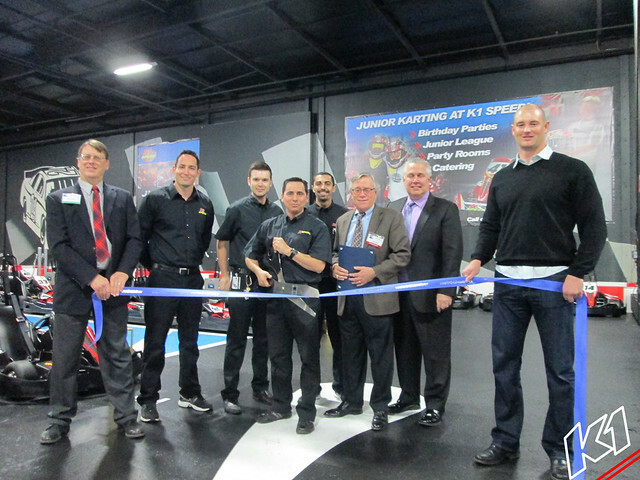 K1 Speed Grand Opening and Ribbon Cutting Ceremony! K1 Speed, an indoor go-kart racing company that offers environmentally-friendly electric karts as well as several large indoor entertainment venues, that feature authentic racing memorabilia, pit cafes, meeting rooms and pool tables, held their grand opening and Ribbon Cutting ceremony on Thursday, January 17, 2013. The K1 Speed team, headed by Manager, Uli Perez, was on hand to welcome guests, along with refreshments being provided by the Red Bull Wings Team. Metro Chamber members and several Ambassadors were in attendance, including: Tim Frazier of Liquid Capital, Ben Prater of Colliers International, Pat Cantwell of Clear Channel Outdoor and Tom Bone of ISU Insurance Services, as well as Metro Chamber staff members, Phil MacDougall, Senior Vice President of Sales and Membership Services and Member Services Coordinator, Taryn Grows.